Cottonseed meal is the by-product of oil extraction from cotton seeds. As a protein-rich feed, cottonseed meal is a common source of protein for ruminants, notably in cotton-producing areas such as India, China and the USA, where it is used as a partial substitute for soybean meal. 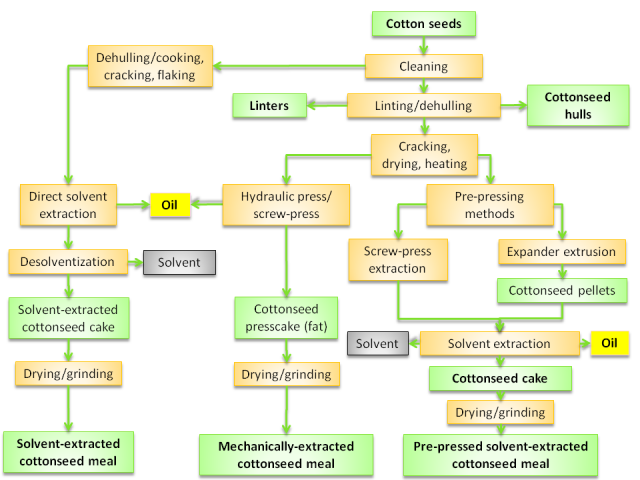 Several methods are used to extract cottonseed oil, resulting in different types of cottonseed meal (see figure). This situation is slightly different from that of other major oilseeds such as soybean and sunflower, where one process is usually dominant. As a result, there is a wide range of cottonseed meals differing in their protein, fibre and oil content. Mechanical extraction: this traditional method of cottonseed oil extraction uses a circular mortar (called ghani in India, Achaya, 1993) or more advanced technology, such as a hydraulic press or a screw press (expeller). The cotton seeds may be dehulled, cracked, dried or heated before being fed to the press. The resulting cake is dried, ground and then processed into large pellets (Ash, 1992). Mechanical extraction is not very efficient and up to 20% of the seed oil may remain in the pressed cake, depending on the technology used (O'Brien et al., 2005). Direct solvent extraction process: as in mechanical extraction, the seeds may be dehulled, cooked, cracked and flaked, but the oil is extracted by solvent (usually hexane) alone. The extracted cake is heated to eliminate the solvent and then generally ground into meal (Ash, 1992). This method was widely used in the 1980s in the USA (Morgan, 1989). Pre-press solvent extraction: this method combines a mechanical extraction (screw press or expander) step, which reduces the oil by one-half to two-thirds of its original level, and a solvent extraction, which results in a 97% oil extraction rate. The dehulled, cracked, dried, heated or flaked cotton seeds are first screw-pressed or expanded and the pressed flakes or pellets are then solvent-extracted. Since the late 1980s, more than 80% of the cotton seeds crushed in the USA is processed by the expander solvent extraction operation. On a worldwide basis, due to available transportation infrastructure, hardware, solvent and skilled labor, cottonseed is still being processed using all existing extraction systems (O'Brien et al., 2005). While some industrial processes include a dehulling step (notably those used in the USA), hulls are not always removed or are sometimes only partially removed, resulting in undecorticated or partially dehulled, fibre-rich cottonseed meals containing in some cases more than 20% crude fibre. Such cottonseed meals were formerly called Egyptian cotton cake (from black cotton seeds) or Bombay cotton cake (from white cotton seeds) (Göhl, 1982). Likewise, oil-rich, mechanically-extracted cottonseed cakes and meals are also available. There is a great variability in the chemical composition and nutritional value of cottonseed meal due to those various processes in addition to the original variability of seeds themselves. Cottonseed meal is mostly used to feed adult ruminants, who are relatively tolerant to gossypol. It can be a good source of protein for monogastrics provided that its limitations are taken into account, notably the fibre content and the presence of gossypol (see Potential constraints) (Tanksley, 1990; Chiba, 2001). Cottonseed meal is also used as fertilizer (NCPA, 2002). Note on terminology: naming and categorizing cottonseed meals is particularly difficult. Although cake (high residual oil, not ground) and meal (low residual oil, ground) should correspond to different products, they are often indistinguishable in the literature as authors tend to use both terms as synonyms. The levels of decortication are often unknown or not well described. To add to the confusion, hulled may mean either without hulls or with hulls, depending on the author. Also, the term expeller is not always clear, as it may apply both to meals that have undergone only mechanical extraction and to meals that have undergone both mechanical (screw press) and solvent-extraction. Likewise, solvent-extracted may apply to meals that have been extracted only with a solvent or to meal extracted using a preliminary mechanical step. World production of cottonseed meal was about 14.7 million tons in 2009 among which 10.9 million tons were used to feed livestock. Cottonseed meal is mainly used in the countries where cotton oil is produced. The top 5 cottonseed meal producers are China, India, Pakistan, Brazil and the USA. These countries account for almost 80% of world production and consume 75% of this production as feed (FAO, 2012). Cottonseed meal is susceptible to mold development when it is too wet, and to dust explosion when it is too dry. Moisture content should be monitored and kept between 5 and 11%. Storage temperature should be between 5 and 25°C. In tropical areas, the temperature of cottonseed meal may rise above 55°C, creating a high risk of ignition. Temperature must be controlled through tight closing and CO2 injections into the storage containers (TIS, 2012). Hexane has long been the preferred solvent of cottonseed oil extraction, but its use is criticized due to concerns regarding environment (contamination), health (neuropathy) and safety (spontaneous ignition of cottonseed flakes after extraction) (O'Brien et al., 2005). New solvents have been assessed and ethanol has shown valuable properties (Saxena et al., 2011). Cottonseed meal is valued as a protein feed, but the protein content is highly variable as it depends on the amount of dehulling and on the efficiency of oil extraction. The range of protein content is from 30% DM for non-dehulled cottonseed meal up to 50% DM for fully dehulled meals. Lower and higher values than these extrema have also been recorded. The fibre content varies accordingly, from 25% (non-dehulled) to 5% (fully dehulled) crude fibre. The various methods used for oil extraction also explain the large range of residual oil present in cottonseed meal. Some solvent-extracted meals contain less than 2% oil, like the other major oilseed meals, but many cottonseed meals contain higher oil values, often in the 5-10% range, and over 20% is possible. The cottonseed meal protein is less rich in lysine than soybean meal (4% vs. 6% of the protein) and since the protein content is generally lower, the total content of lysine and essential amino acids is lower for cottonseed meal (Feedipedia, 2012). The main constraint of cottonseed meal is the presence of gossypol, which limits its use in non-ruminant animals and in reproductive ruminants (see Potential constraints). Cottonseed meal usually contains gossypol, unless it has been obtained from glandless (gossypol-free) seeds. Monogastric animals and young ruminants are highly susceptible to gossypol in cottonseed meal. Mature ruminant animals do not suffer from cottonseed meal consumption but it may affect their reproductive performance (European Commission, 2003). The toxicity of gossypol is described in detail in the cotton seeds datasheet. When cotton seeds are extracted, gossypol glands are broken, releasing the gossypol in the cake. The effects of processing (pressure, heating, solvent, duration) on the free gossypol content are variable (Zahid et al., 2003b). In some cases, the process decreases the gossypol content, improving the nutritional value (Jimenez et al., 1989; Nikokyris et al., 1991; Mena et al., 2001; Mena et al., 2004; Guedes et al., 2010; Nunes et al., 2010). In others, however, the process may have no effect, or result in a higher free gossypol content and, therefore, higher toxicity (Morgan, 1989). The screw press method uses heat which increases the binding of the gossypol protein, converting free (toxic) gossypol into bound (non-toxic) gossypol, and the resulting meals have the lowest amounts of free gossypol (200-500 mg/kg) (Morgan, 1989; O'Brien et al., 2005). While heating may cause loss of protein quality owing to binding of gossypol to lysine at high temperatures, the shearing effect of the screw press inactivates gossypol at temperatures which do not reduce protein quality (Tanksley, 1990). The solvent extraction method (with no mechanical and heating step) does not require high temperatures, which limits the gossypol-protein binding, and the amount of residual free gossypol may be up to ten times higher than in screw-pressed meals (1000-5000 mg/kg). Indeed, the direct solvent extraction method may have been responsible for the rise of gossypol toxicity observed in the 1980s in the USA (Morgan, 1989). In the pre-press solvent extraction method, the amount of free gossypol is in the 200-700 mg/kg range, comparable to that of screw-pressed meals (O'Brien et al., 2005). New solvents such as ethanol can inactivate a greater proportion of the gossypol, resulting in safer cottonseed meals (Saxena et al., 2011). Commercial production of cottonseed meals is now achieved routinely with 1000-2000 mg/kg remaining as free gossypol (EFSA, 2008). Gossypol toxicity can be alleviated through the addition of iron salts. The following ratios of iron to free gossypol have been used to improve growth performance: 1:1 (cattle, pigs and Nile tilapias), 2:1 (broilers) and 4:1 (layers) (El-Saidy et al., 2004; European Commission, 2003). Cottonseed meal is a good protein source for ruminants (Göhl, 1982). It is palatable with a nutritive value (for dehulled meals) slightly lower (85-90%) than that of soybean meal. It is among the least expensive sources of protein in some regions (NDDB, 2012; McGregor, 2000). It is for example the main source of protein for livestock in the cotton growing belt of India (NDDB, 2012). However, while gossypol is much less toxic to ruminants than to pigs and poultry, it is still recommended to limit its use to mature and non-reproductive animals, females and males, for short periods only and at relatively low inclusion rates, unless free gossypol content is known to be below the risk level. Generally, cottonseed meal can be safely included up to 15% in cattle diets (NDDB, 2012). The effect of gossypol on reproductive performance in ruminants is discussed below. Cottonseed meal is a good protein supplement for poor quality forages and fibrous by-products because of its high protein digestibility. Association with a source of degradable energy increases the efficiency of cottonseed meal supplementation (Brown et al., 1997; Bonsi et al., 1997) since it decreases the urinary nitrogen. Indeed, most of the cottonseed meal energy comes from its fat content (for cottonseed meals with a high amount of residual oil) that, at high levels, does not contribute to the development of the rumen microbial population (Bonsi et al., 1997). Both decorticated and undecorticated cottonseed meal have a constipating effect on cattle, which is beneficial in feeds with a high molasses content (Göhl, 1982). In the USA, under typical conditions, even high-production dairy cows can be fed cottonseed meal without adverse effects (McGregor, 2000). Cottonseed meal is a good protein source for dairy cows fed fibrous by-products (straws) or forages of low nutritive value. Generally, cottonseed meal can replace other oilseed meals (soybean, rapeseed, sunflower and groundnut) without affecting milk yield and composition. However, due to the variability of the fat, protein and gossypol content, results are sometimes contradictory. When supplementing highly digestible forages such as maize silage, cottonseed meal can replace soybean meal without detrimental effects on DM intake and milk yield when the diet protein is 16% DM, but the effect is negative when diet protein is only 13% (Coppock et al., 1987). The following table presents dairy cow trials with cottonseed meal included in the diet. Calves are susceptible to gossypol toxicity because of their incomplete rumen development. It is recommended that concentrates for calves under 5 months old contain no more than 10-15% cottonseed meal (Göhl, 1982). Results obtained with growing calves are variable. In diets for pre- and post-weaning calves, cottonseed meal gave the same weight gains as rapeseed meal or soybean meal (Coppock et al., 1987) or slightly lower gains than soybean meal (Yazdani, 2005). In buffalo calves, cottonseed meal gave higher weight gains when compared with sunflower meal (Yunus et al., 2004). It is probable that those results are influenced by interactions in the diet (level of undegradable protein in the rumen or lignin content). In growing heifers, steers and bulls, cottonseed meal is a valuable protein supplement and can replace other oil meals (soybean, copra or sunflower). The following table presents trials with diets including cottonseed meal for growing cattle. Cottonseed meal can replace sesame or groundnut meal as the protein source in diets for rams with a similar daily weight gain of 76.3 g/d and a better feed conversion ratio of 0.85 (Ahmed et al., 2005). Cottonseed meal used in diets for growing lambs gave the same performance as other oilseed meals (groundnut, sesame, canola, soybean). Heat treatment (cooking) improved performance, probably due to a reduction of gossypol combined with increased rumen undegradable protein (Nagalakshmi et al., 2003). In Egypt, adding ferrous sulfate to the diet overcame the lower results observed with cottonseed fed to 6 month old lambs (Ward et al., 2008). The following table presents trials with cottonseed meal in the diets of growing sheep. Cottonseed meal has been tested in the diets of dairy and meat goats with variable results, as summarized in the table below. While less susceptible than monogastrics, ruminants are not immune to the toxic effects of gossypol. Its effect on erythrocyte fragility increases with duration and dose, and is age dependent: younger animals are more susceptible to gossypol toxicity than older ones (Matondi et al., 2007). Intoxication with gossypol resulted in decreased hemoglobin and increased erythrocyte fragility in dairy cows fed a high level of cottonseed meal (45% in the diet) (Coppock et al., 1987). Gossypol affects particularly the reproductive performance of ruminants, both males and females. Detrimental effects of free gossypol fed to male ruminants through cottonseed meal include histological changes in testicular tissue and lower sperm quality. Some of these effects are reversible once the diet no longer contains gossypol. The table summarizes changes noted in young bulls fed gossypol containing cottonseed meal. Detrimental effects of free gossypol fed to female ruminants through cottonseed meal include lower conception rates, lower embryo survival and anomalies in offspring, as summarized in the table below. Cottonseed meal is a protein feed that can be used in pig rations as a substitute for other protein sources such as soybean meal, meat and bone meal or fish meal. However, its high fibre content, highly variable protein content, lower amino acid availability and the presence of free gossypol (see below) limit the use of cottonseed meal in pig diets. When cottonseed meal provides less than 100 mg/kg of free gossypol in the diet, it can be fed to pigs up to 8-15% of the diet without toxic effects (Adeniji et al., 2008; Li DeFa et al., 2000). However, its inclusion results generally in a decrease in feed intake, digestibility (energy, organic matter and amino acids including lysine, threonine, isoleucine, valine, aspartic acid and serine), daily gain and feed efficiency (Paiano et al., 2006; Fombad et al., 2004; Li DeFa et al., 2000; Balios et al., 1989; Papadopoulos et al., 1987). Undecorticated cottonseed meal and solvent-extracted meal (with no mechanical extraction step) could be used up to 10% of the diet; higher levels decreased daily weight gain and increased the feed:gain ratio (Singh et al., 2005; Balogun et al., 1990). In Ghana, in weaner pigs (about 10 kg LW), cottonseed cake could be fed up to 15% of the diet without hampering animal performance, and with a significant reduction of feed costs (Rhule, 1995). In gestating sows fed at 10% cottonseed meal in the diet, premature farrowing was observed (Love et al., 1990). Cottonseed meal was suggested as a remplacement for soybean meal at up to 25-30% of the diet (Fombad et al., 2004; Thomaz et al., 1997). A higher substitution rate (40%) was found to have deleterious effects (LaRue et al., 1985). The negative effects of cottonseed meal may be due to gossypol content and to the lower lysine availability resulting from lysine-gossypol binding (Batterham, 1989). These effects can be partly alleviated through lysine (L-Lysine or lysine from blood meal) or iron supplementation (40 g/kg FeSO4) (Mello et al., 2012; Moreira et al., 2006; Balios et al., 1989). Cottonseed meal resulting from glandless cotton seeds could be safely fed to growing pigs and fully replace soybean meal (up to 33% of the diet). However, it still resulted in lower weight gains, which could be alleviated by lysine supplementation (Zongo et al., 1993). The effect of cottonseed meal on carcass quality has not been assessed recently. Earlier experiments gave inconsistent results: 75% soybean replacement with cottonseed meal resulted in less valuable carcass, while inclusion of 16% cottonseed meal increased the melting point of carcass fat (Papadopoulos et al., 1987; Baustad, 1974). Zinc in cottonseed meal has a low availability in pigs due to the presence of phytates that combine with zinc to form zinc phytate (Blair, 2007). Gossypol has deleterious effects on growth and reproductive performance in pigs. The "no observed adverse effect level" (NOAEL) on performance in growing pigs is about 100 mg/kg and toxicity signs usually occur above this level (Tanksley, 1990). Growing pigs fed a 15% protein diet started showing signs of toxicity and reduced performance when fed more than 100 mg/kg gossypol. Increasing diet protein reduced gossypol toxicity: pigs fed on a 30% protein diet could receive up to 300 mg/kg of gossypol without deleterious effects (Hale et al., 1957 cited by European Commission, 2003). Cottonseed meal containing 146 mg/kg free gossypol resulted in lower feed intakes and weight gains in growing pigs (Fombad et al., 2004; Clawson et al., 1966). Pigs fed diets containing 244 or 400 mg/kg free gossypol experienced symptoms of laboured breathing and purple coloration of the nose and ears, resulting in some deaths (Clawson et al., 1966). At 348 mg/kg free gossypol concentration, no mortality was observed but the weight of the liver and heart increased significantly at all gossypol levels, and the increase was dose-dependent (Fombad et al., 2004). Pigs fed on diets containing 55-138 mg/kg free gossypol developed health and reproduction troubles: mortality increased and reproductive performance decreased, particularly in boars. Sows also showed delayed oestrus (Qi LingYun et al., 1984 cited in EFSA, 2008). Testosterone concentrations in blood were decreased in boars fed diets containing 110 mg/kg of free gossypol and above. Cottonseed meal is one of the main protein sources in some countries, and its use in poultry diets is therefore essential. The main limitation to the use of cottonseed meal in poultry diets is the toxic effect of gossypol and cyclopropenic acids (Nagalakshmi et al., 2007). Cottonseed meal is a highly variable product. Notably, non dehulled meals may have a very high fibre content and are therefore of low value for poultry. Due to such variations, including in the free gossypol content, the effect of a given level of cottonseed meal is not constant (Diaw et al., 2011). Another limitation is amino acid content (particularly lysine) and availability, as lysine-gossypol binding prevents lysine absorption and decreases its digestibility. It is advisable to take lysine digestibility into account when formulating poultry feeds containing cottonseed meal (Fernandez et al., 1995). Cottonseed meal can be used efficiently for broilers if enough digestible lysine is provided in the diet. The level at which cottonseed meal lowers animal performance depends on the level of free gossypol, on the type of cottonseed meal and on the nutritional balance of the diet (Nagalakshmi et al., 2007). 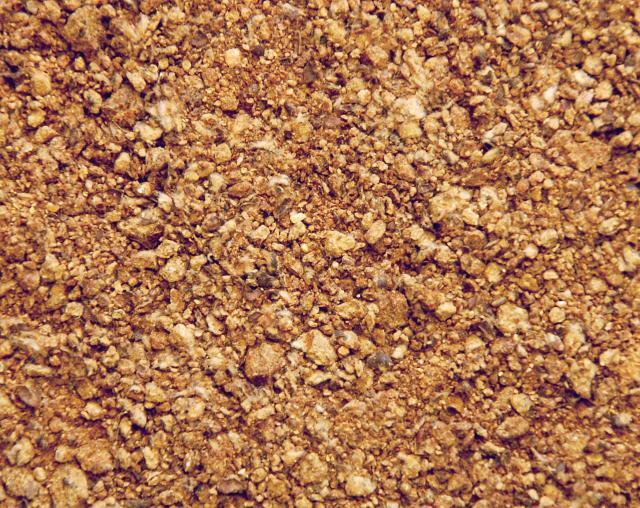 A simple weight-for-weight replacement of soybean meal by cottonseed meal is likely to result in amino acid deficiency. Generally, cottonseed meal can be considered to be safe up to 10-15% of the diet (El-Boushy et al., 1989; Fernandez et al., 1995). However some publications report that performance decreased at lower inclusion rates while others found that performance was maintained above the 20% inclusion rate (Azman et al., 2005; Gamboa et al., 2001; Ojewola et al., 2006). At moderate incorporation levels, feed intake can be increased, which impairs feed efficiency (Watkins et al., 1993; Batonon et al., 2015). At higher inclusion rates or when free gossypol content of cottonseed meal is high, the inclusion of iron (as sulfate) or lysine supplementation can help to alleviate the negative effects of cottonseed meal (Henry et al., 2001; Ryan et al., 1986). Cottonseed meal resulting from glandless cotton varieties does not cause gossypol toxicity and its potential is therefore higher (Diaw et al., 2011). However amino acid digestibility is still lower than that of soybean meal, and care should still be taken when formulating the diet. The general recommendation is to use dehulled cottonseed meal at rates up to 15% of the diet, with careful attention paid to lysine amounts in the feed formulation. Higher rates can be used when cottonseed meal has an economic advantage, even with a risk of lower feed efficiency. In such cases both iron and lysine supplementations are recommended. The main potential problem of using cottonseed meal for layers is the effect of gossypol on egg yolk colour (greenish discoloration, mottling), which occurs mainly after a period of storage (Ryan et al., 1986). Cyclopropenoic acids can also cause a pinkish coloration of the albumen (Nagalakshmi et al., 2007). The problem can be partly solved with iron supplementation, which reduces the effects of gossypol (Panigrahi et al., 1989; Panigrahi, 1992). The effects of cottonseed meal on laying performance depend on the experimental conditions, and particularly on the free gossypol content of the cottonseed meal (Nagalakshmi et al., 2007). Some publications report a decrease in egg laying at inclusion rates as low as 2.5% cottonseed meal in the diet, while other authors report that egg production is good with up to 20% cottonseed meal in the diet (Adeyemo et al., 2008). Cottonseed meal was tested successfully at 25% inclusion rate in broiler breeder diets, with no detrimental effect on performance and on the quality, fertility and hatchability of eggs (Lordelo et al., 2004; Ryan et al., 1986). The general recommendation is to limit cottonseed meal to 10% in layer diets, and to add iron when more than 5% cottonseed meal is included in the diet. Higher levels (15%) can be used when egg yolk coloration problems do not have marketing consequences. Cottonseed meal from glandless varieties can be used at 15-20% if feed formulation is adequate. Growth performance of Japanese quails was not significantly affected by moderate (11%) levels of cottonseed meal in the diet while it decreased with higher levels (Yannakopoulos et al., 1989). In another experiment, growth was maintained with 30% cottonseed meal (Odunsi et al., 2007). Egg production was affected by cottonseed meal inclusion in the diet of laying quails (Odunsi et al., 2007; Yannakopoulos et al., 1989). However, in both experiments, lysine levels were lower in the cottonseed meal diets. Recommendations for quails are similar to those provided for broilers and layers, and in any case lysine must be adequately supplied in diets containing cottonseed meal. Cottonseed meal used to be considered toxic for rabbits and it was recommended to not exceed 5% of the diet (Voris et al., 1940; Casady et al., 1962). However, a daily intake of free gossypol up to 10-15 mg per rabbit and per day was found to be safe, resulting in inclusion rates of up to 15% for low-gossypol commercial cottonseed meals available in the 1980s (McNitt, 1981; Nistri et al., 1983). The maximum free gossypol intake was also frequently exceeded in some studies without any problem. For example, cottonseed meal with 700 mg/kg of free gossypol was used without detrimental effects on growth rate and feed efficiency at 15 and 30% in the diet, resulting in a daily free gossypol intake of about 20-22 mg/kg/rabbit/day (Payne et al., 1988). In a one-year-long experiment, cottonseed meal containing 675 mg/kg free gossypol was included up to 20% with a non-significant positive effect on average litter size at kindling or bucks conception rate (Tor-Agbidye et al., 1992). However, a higher mortality rate of does fed the 20% cottonsed meal diet (8 does/diet) and a reduction of fattening growth rate suggested that 10% was a safe inclusion. If it is suspected that gossypol has a negative effect, this can be suppressed by the addition of 100 mg/kg of iron sulphate before pelletting of the cottonseed (Nistri et al., 1983). While many studies have focused on the negative effects of gossypol, the decrease of performance can also be attributed to the deficiency in essential amino acids in cottonseed meal (Tor-Agbidye et al., 1992), as it provides only 75 and 80% of the requirements in sulphur amino acids and lysine respectively (Lebas, 2004). If these deficiencies are not corrected, the lower performance resulting from substantial amounts of cottonseed meal in the diet may be attributed to protein imbalance rather than to free gossypol exclusively (Fotso et al., 2000; Mbanya et al., 2005). In agreement with recent results, it seems reasonable to propose a safe inclusion level of cottonseed meal up to 10-15% in complete feeds for rabbits (Bhatt et al., 2001; Sarwatt et al., 2003; Mbanya et al., 2005; Kpodékon et al., 2009). This proportion could be increased up to 20-25%, or over if necessary (Fotso et al., 2000; Prasad et al., 2000). Cottonseed meal is a potential source of protein for fish. As a highly palatable ingredient, it has often been assessed in order to replace soybean meal in fish diets (Li et al., 2006). In addition to the presence of gossypol (see below), the fibre content and the low availability of lysine, methionine and cystine in cottonseed meal limit its use in fish farming. Using decorticated cottonseed meal is preferable (Hertrampf et al., 2000). Cottonseed meal is less digestible than soybean meal in many fish species, including rainbow trout (Oncorhynchus mykiss), Nile tilapia (Oreochromis niloticus), channel catfish (Ictalurus punctatus), Schlegel's black rockfish (Sebastes schlegeli) and the Australian silver perch (Bidyanus bidyanus) (Chen et al., 2002; Morales et al., 1999; Smith et al., 1995; Wilson et al., 1985). Its digestibility is similar to that of soybean meal in red drum (Sciaenops ocellatus) and palmetto bass (Female Morone saxatilis x Male M. chrysops) (Gaylor et al., 1996; Sullivan et al., 1995). In the common carp (Cyprinus carpio), cottonseed meal compared favourably with groundnut meal, sunflower meal and maize meal and resulted in higher weight gains, and higher feed and protein efficiency (Desai et al., 2011). Because cottonseed meal tends to reduce feed intake, growth and feed efficiency in fish, the recommended levels are generally low, in the 5-15% range, notably in salmonids (Hertrampf et al., 2000). However, the actual limit depends on the fish species, on the type of cottonseed meal and on the level of gossypol, as shown in the table below. As in other animal species, free gossypol has toxic effects on fish health and performance, though this toxicity depends on species, size, stage of growth, diet composition and growing conditions (Li et al., 2006), as summarized in the table below. After Li et al., 2006. Improvements in disease resistance and an immune response in fish fed high levels of cottonseed meal and gossypol have been observed. However, practical benefits are limited as the levels of gossypol needed for such positive effects also depress growth (Li et al., 2006). Iron addition has been effective in reducing toxicity of free gossypol in Nile tilapia, including fingerlings, but not in channel catfish (Jiang Ming et al., 2011; El-Saidy et al., 2004; Barros et al., 2000). Cottonseed meal could be used as pond fertilizer (Middendorp, 1995). However it had no better effect than inorganic fertilizers on phytoplankton or zooplankton development (Mischke et al., 2004). Cottonseed meal can be a protein source for crustaceans, through gossypol and fibre content limit the inclusion rate. It is less digestible than soybean meal for red swamp crawfish (Procambarus clarkii) and white shrimp (Penaeus setiferus) (Brunson et al., 1997; Reigh et al., 1990). Practical inclusion rates are 5-10% (Hertrampf et al., 2000) though higher levels may be used. As in other species, the free gossypol content of cottonseed meal may have deleterious effects in crustaceans. Brunson, J. F.; Romaire, R. P.; Reigh, R. C., 1997. Apparent digestibility of selected ingredients in diets for white shrimp Penaeus setiferus L.. Aquaculture Nut., 3: 9–16. Dabrowski, K., K. J.; Rinchard, L. J.; Ciereszko, A.; Blom, J. H.; Ottobre, J. , 2001. Gossypol isomers bind specifically to blood plasma proteins and spermatozoa of rainbow trout fed diets containing cottonseed meal. Biochimica et Biophysica Acta, 1525 (1-2): 37–42. Gaylord, T. G.; Gatlin, M., III. , 1996. Determination of digestibility coefficients of various feedstuffs for red drum (Sciaenops ocellatus). Aquaculture, 139 (3/4): 303–314. Lim, C.; Yildirim-Aksoy, M.; Klesius, P. H., 2002. Dietary cottonseed meal affects growth, hematology, immune responses of Nile tilapia. Global Aquacult. Advoc., 5 (6): 29–30. Robinson, E. H.; Rawles, E. H.; Oldenberg, P. W.; Stickney, R. R., 1984. Effect of feeding glandless or glanded cottonseed products and gossypol to Tilapia aurea. Aquaculture, 38: 145–154. Sullivan, J. A.; Reigh, R. C., 1995. Apparent digestibility of selected feedstuffs in diets for hybrid striped bass (Morone saxatilis x M. chrysops ). Aquaculture, 138 (1-4): 313–322. Wilson, R. P.; Poe, W. E., 1985. Apparent digestible protein and energy coefficients of common feed ingredients for channel catfish. Progressive Fish-Culturist, 47: 154–158.